Hit the road and enjoy the journey as much as the stay behind the wheel of this Jayco Redhawk SE model 22C! This unit offers you and your family a great way to travel. Just load up your personal belongings, fill up the 57 gallon fuel tank and away you go! Once you reach your destination, or find a stopping point for the night, you just need to pull over somewhere safe and enjoy. 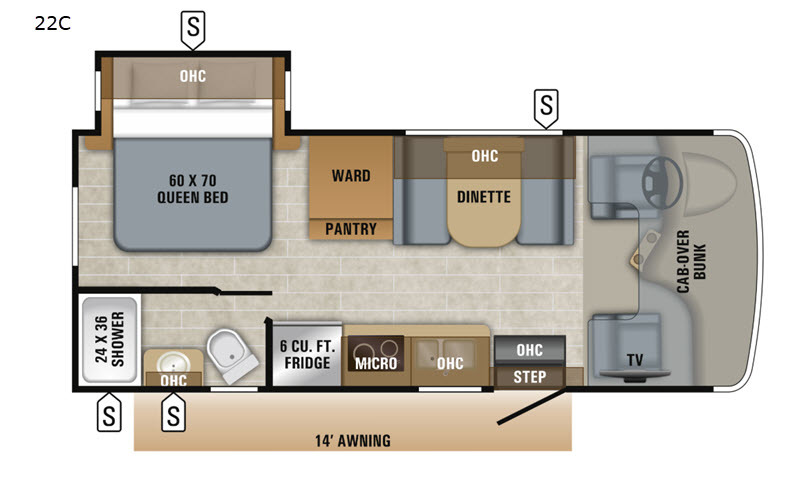 The cab-over bunk fits two adults or children with a weight rating of 750 lbs., there is a queen bed slide out in back with storage beneath, and the dinette can also be turned into a bed for one more tired camper as well. 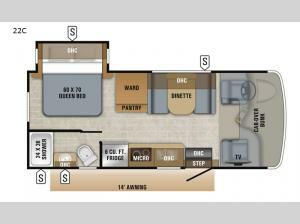 A 32" LED HDTV is located up front in the cab-over space for your enjoyment, plus you can easily whip up a meal or snack when you get hungry with a two-burner cook-top, refrigerator, and convection microwave oven at your fingertips. A full on-board bathroom makes it even more enjoyable when you can take a shower and use the facilities without even stepping foot outside. When you do get outside, you can open up the 14' electric awning and create a nice outdoor living area to enjoy. You will also find plenty of storage both inside and out!